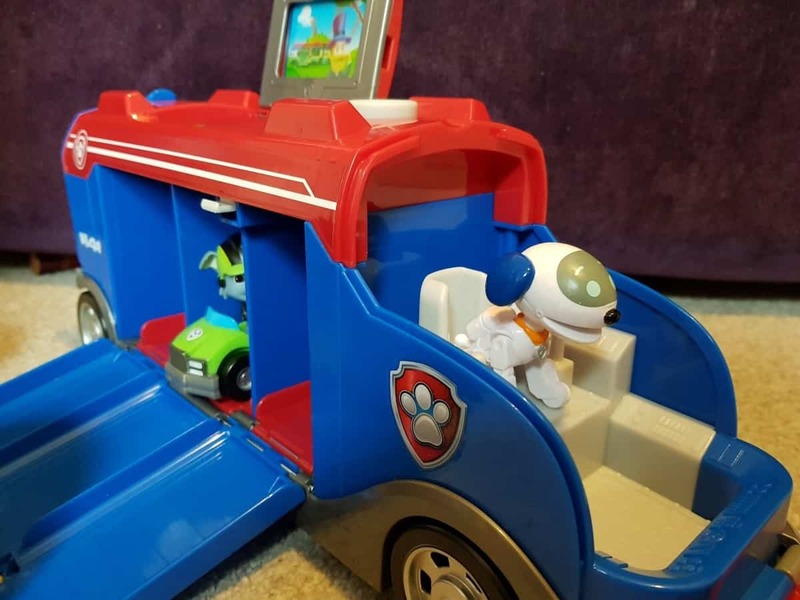 If you’ve got small kids then you’ll probably be aware of PAW Patrol, and will also be relieved to hear that there are a whole load of new Mission PAW episodes out on Nick Jnr, hurrah! My kids can watch the same thing over and over again but I like a bit of variety! 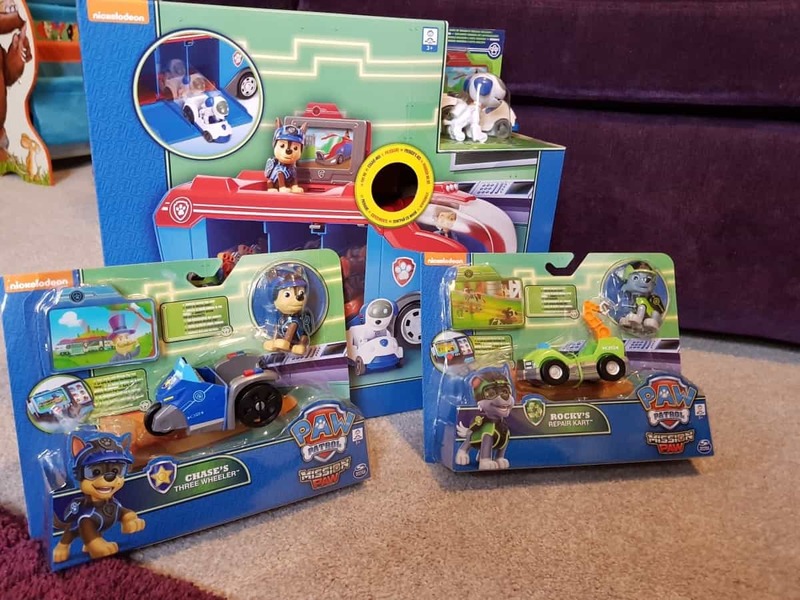 To help them celebrate the new episodes Athena & Alro were the lucky recipients of the new PAW Patrol Mission PAW Mission Cruiser, which houses PAW Patrol mini vehicles and figures. 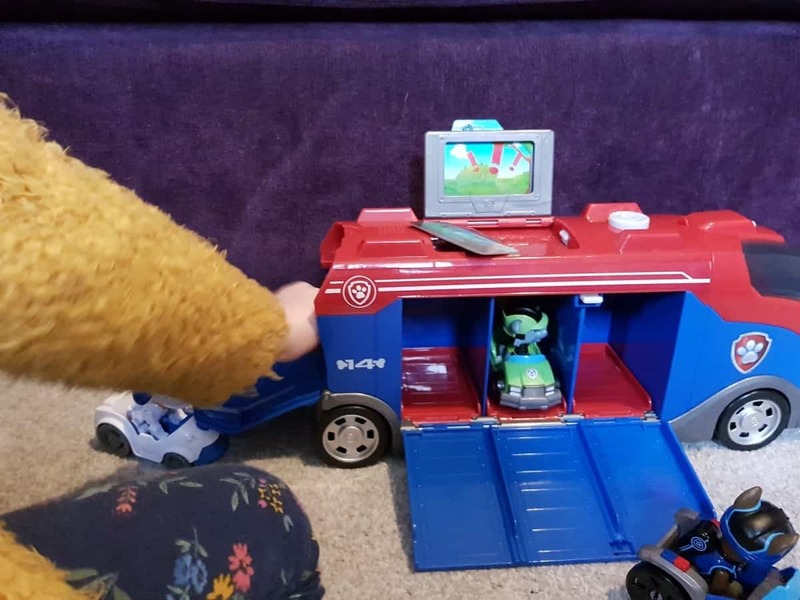 The Mission Cruiser has three spaces at the side for vehicles to be kept in, with quick-release ramps (triggered on the other side of the vehicle) to help the characters shoot off on their missions ‘super fastly’ as my two year old says when he triggers them! On top of the cruiser is a pop up screen so that you can place the animated Mission Paw card in there so the pups can see exactly what their mission is! Athena and Arlo are currently taking turns in going on their own ruff-ruff rescue missions and bellowing ‘No job is too big, no pup is too small’ as they hurtle the cruiser around the living room and along the hallway! There is a button for sounds on top of the cruiser (batteries are already installed, rejoice! no more rummaging around for spares!) which are not too obnoxiously loud, nor do they go on forever, again grown ups can rejoice! 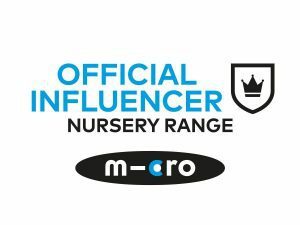 There are six mini vehicles you can collect, each coming with a character; Chase’s Three Wheeler, Skye’s Cycle, Marshall’s Rescue Rover, Rubble’s Mini Miner, Zuma’s Hydro Ski and lastly Rocky’s Repair Kart, and these are priced at £9.99. The PAW Mission cruiser comes with Robo Dog in his little car, and the rest are sold separately. 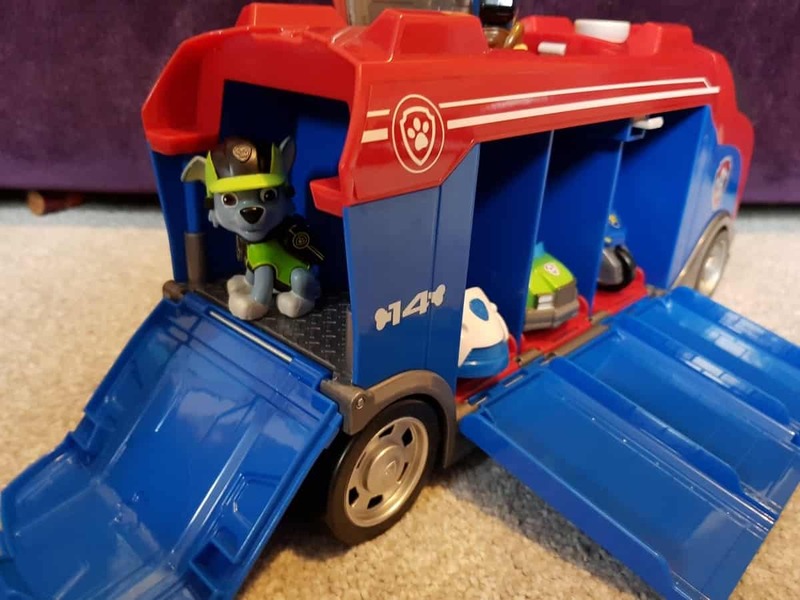 Arlo at very near three years old is at the perfect stage for imagination games, and he really loves fully immersing himself in things, last week it was batman but since we opened up the PAW Patrol Mission PAW Mission Cruiser he’s PAW Patrol obsessed again! He loves pretending to be the characters and gets quite irritated at his sister if she dares to try and put the characters in the wrong cars! He’s very careful the Mission Paw cards, I was a but worried they might get flung aside and lost but he’s been keeping them safe in the back section of the cruiser, which is actually big enough for a fourth character and vehicle, so I think I’ll be treating him to another one soon! He’s also very particular about which character is allowed to be in the drivers seat, which is accessed by lifting up the windscreen. Currently only Chase is allowed to be in control of the Pawsome missions when Arlo is in charge, but whoever is ‘allowed’ to drive I really love watching my kids expand on the stories they see in the episodes and bring them to life at home. I also love the fact that everything packs up back into the cruiser at the end of the play-session! 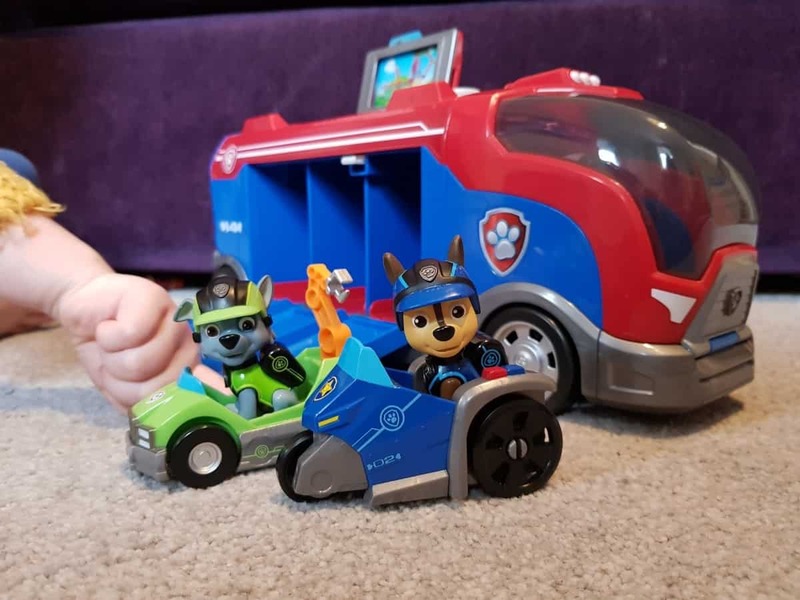 The PAW Patrol Mission PAW Mission Cruiser and Mission Paw Mini Vehicles are available from all good toy shops or from Amazon. We were sent these toys in exchange for an honest review.